This postcard-sized boarding pass was tucked away inside a copy of the 1959 edition of "Public Administration," a college textbook by Marshall Edward Dimock, Gladys Ogden Dimock and Louis W. Koenig. The ticket was for economy class. The passenger was informed that "only one small hand baggage allowed in cabin." "WT-110" might refer to the departure gate. Anyone know if that provides a hint as to what the departure airport was? Nigeria Airways ceased operations in 2003. You can't quite tell from the the boarding pass, but its logo consisted of the Nigerian flag with a flying green elephant (named Skypower) in the center. 1. This area of Nigeria is undergoing a transition that will culminate with Port Harcourt becoming a new city to be called the Greater Port Harcourt City. Thanks for this great post. The Christmas rush phenomenon was already well established in the booming and then rapidly growing domestic as well as international services, when many Nigerians typically travel to their home cities and towns for the Christmas holidays. 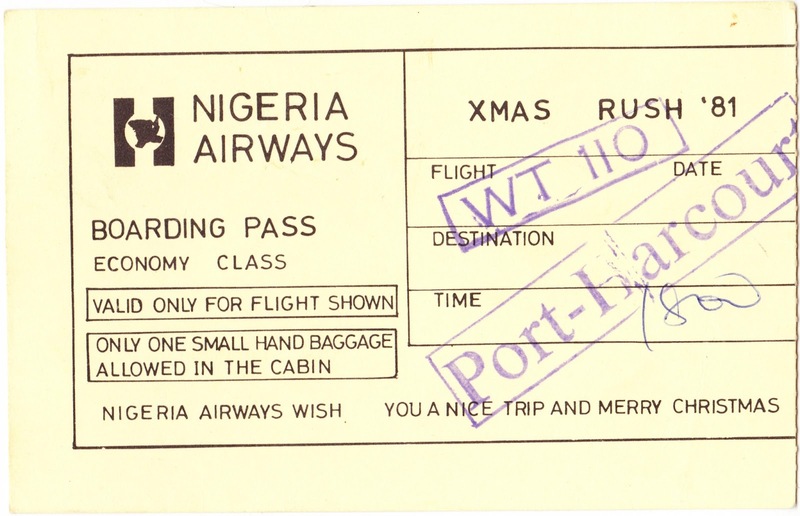 WT110 is not a gate but the flight number and is probably a Lagos to Port Harcourt flight, which typically departed from the the old Ikeja Airport terminal or the General Aviation Terminal. I grew up in Lagos before the current airport opened and remember the old Ikeja airport. It later became the domestic terminal.